Orel Füssli is a chain of bookstores with branches to be found all over Switzerland, several of them being in Zürich. However this specific store, known as "The Bookshop", is the only bookstore in town which focuses exclusively on books in English. You can find a huge selection of the latest releases in fiction and non-fiction, but also time-tested classics, not to mention a strong children's section, where readings are held every first Saturday of the month. The store's offer doesn't fall short of any major bookstores in English speaking countries. Its stock of over 30 000 books in English should satisfy the desires of the most demanding book-hunters and in case you seek something the store doesn't have on stock, you can make an order. You can also check the newest arrivals in different categories on their website. Note that this is not a small independent store on the corner, so beware of the rather high prices, there's no second hand section either. 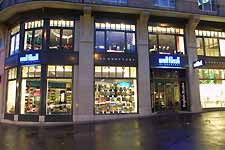 A three-storied book palace established in 1999, located in the center of Zürich. The biggest city in Switzerland is a city with a multicultural character, and Orel Füssli is very much appreciated by the whole expat community, since a very wide, and, even more importantly, up-to-date selection of English titles and even DVDs is available under one roof. To satisfy the needs of expats and tourists, the bookstore holds a considerable amount of books on living in Switzerland, which will surely help you get by. Thanks for the nice comment. And thanks for pointing out the error (we like to test our readers, if they read our posts thoroughly)... No, in fact I was really embarrassed. The worst thing is, I DO know that Bern is the capital.